Carole: I was born in Austin, Texas and have lived here all my life. Austin is a great stitching town. Both EGA and ANG are very active, and the entire arts community is enervating. Besides needlepoint, which is my passion, there's weaving and spinning and painting and music and beading and pottery, not to mention the active music culture.... you get the picture. 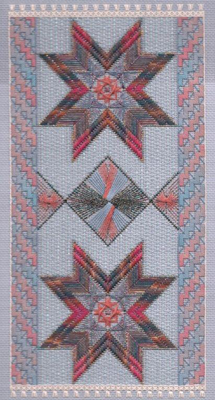 I grew up loving to do handwork of all sorts, but in the early 80s I realized that needlepoint was my passion. I've been going to the EGA and ANG national seminars since 1983; I find that being surrounded by hundreds of other stitchers is stimulating and inspiring. It's like finally being in a group of people that speaks my language! I was certified to teach needlework by EGA about 1990 and have been actively traveling and teaching ever since. I love all the aspects of it -- even the airports and airplanes. I love going to new places and finding old friends! Michael: I was born in Texas as well, but, unlike Carole, I escaped. After many years toiling in the political thickets of Capitol Hill in Washington, I am now enjoying the country life at the foot of the Blue Ridge Mountains of Virginia. My avocation switched from music to stitching decades ago. For the last 12 years, it has become more serious, as I started to design and then teach. Since moving to the Shenandoah Valley of Virginia, I helped to found The Shenandoah Valley Chapter of ANG and have been actively involved in its development. I enjoy interacting with stitchers from all over the world, both in person and online. Tell us about your families. Carole: I've been married for what seems like forever: my husband Larry is a college professor. It's amazing how we run into the same situations with students in our disparate teaching careers. I have two children, neither of whom, sadly, is very interested in needlework -- my daughter Leslie is a librarian and my son Jeffrey is a video game programmer. I laugh when I think of them having to disperse my stash when I am gone! It’s going to be a great garage sale! Michael: My partner David is also a stitcher, so we have quite a studio to share with our three dogs. David does amazing stitch-painted designs, and is always ready (maybe too ready) to offer opinions as I stitch. We have a son, daughter-in-law and a beautiful, perfect, adorable granddaughter living Florida at the moment. Our son, Shaun, created my website, www.shenandoahstitcherydesigns.com, and has just created the website for StitchPlay Designs. He’s amazing! Carole: I don't remember ever not wanting to stitch. My first specific memory is saving up Chase and Sanborn coffee can lids to send in for free crewel kits. A neighbor taught me to knit. I sewed and made all my own clothes for years (I’m over that!). One of the things I like about EGA is trying all the different techniques - but I always come back to needlepoint. Michael: My former grandmother-in-law introduced me to continental stitch on pre-stitched canvases in the late 70s. I like to think I’ve come a long way! While working in DC, one day I decided I was tired of putting commas in legislation at work, so I walked into Needlewoman East, and begged them to addict me to a very expensive hobby. They opened up a whole new world, starting with basketweave. My maternal grandmother was a very talented needlewoman, so I like to think I come by the addiction naturally. Was there anything or anyone that was instrumental in getting you started professionally? Michael: My first design, Scheherazade, was done more or less on a bet that I made with myself, foolishly in the presence of others. 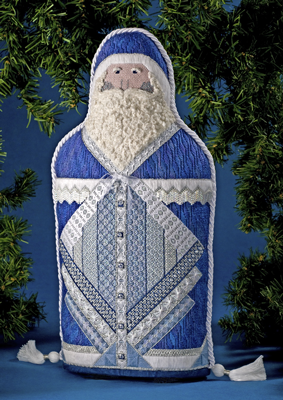 To my bemused astonishment, Joyce Lukomski published that piece in Needlepoint Now. 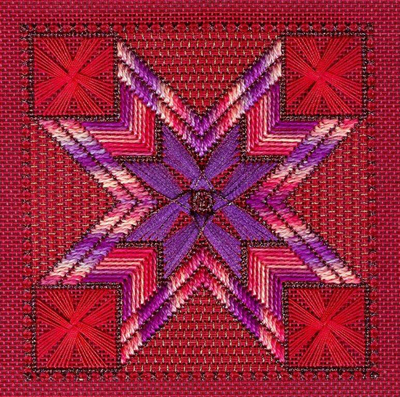 Becoming a member of the American Needlepoint Guild opened up a new world of possibility, although for years, my job on the Hill kept from attending seminars on a regular basis. My friends and fellow members of The Shenandoah Valley Chapter ANG have been very encouraging and supportive of my efforts to design and teach on the national level. Michael: As previously noted, my son has designed and manages both my personal website (www.shenandoahstitcherydesigns.com) and the new website for our business, StitchPlay Designs (www.stitchplay.com). I often ask my partner, David, for his opinion on a stitch or color as I am designing and it is he who came up with the name of the business I have started with Carole. Michael: Having an undergraduate degree in music, music continues to be an important part of my life. Two of my most popular designs are named for operas by the great early 20th century German composer Richard Strauss. Music and needlepoint have more in common than you might believe at first glance: rhythm and repetition and pattern and the eclectic arrangement of disparate elements to create a composition of great beauty. Carole: Sometimes I think my biggest inspiration is the looming deadline. Once there's a deadline, I get my best ideas. I read a lot, and I'm interested in history and geography, so I've a number of pieces are inspired by foreign locales, most of which I've never visited. They are like "wishing" pieces. 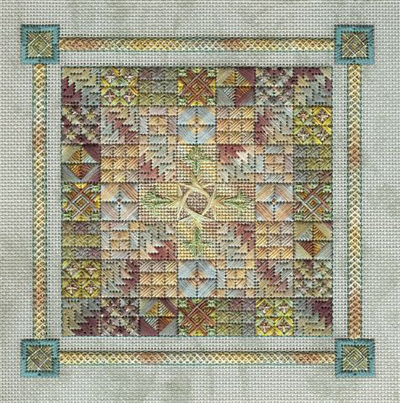 Michael: I find inspiration in architectural elements and in traditional American quilt patterns. My designs are all geometric, even though math was my worst subject in school. I also like to experiment with color. I love the way color can totally change a stitch or a design. I love to pick different colorways for the same design, and then to see how it changes the interpretation. Carole: I'd have to say the advent of the computer has been the most significant change. I remember doing instructions laboriously by hand. Now I do them laboriously on the computer! I really work hard on my diagrams and instructions, revising them continually as I teach a project. The computer makes this possible. It also makes it possible to 'visit' places and research their designs, all from the comfort of my desk chair. It makes it possible for Michael and me to collaborate on a stitched project even though we live 1000 miles apart. Michael: Echoing Carole’s thought on this, the computer really is an invaluable tool. 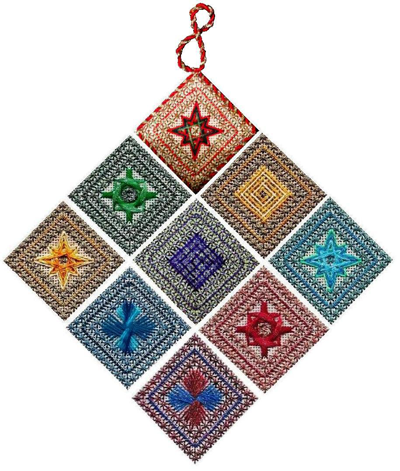 I have added much more detail in my instructions as I have gone along and I also have added close-up photos of individual motifs in the designs. I believe that the more information you provide the students the more likely it is that they will actually complete any given design. And nothing is more flattering than having a student actually stitch on a piece after class. Do you ever collaborate with other designers or teachers and, if so, what kinds of projects do you work on? Carole: In the past year, Michael and I have started a new company called StitchPlay Designs. We have (and will still be) teaching in person together, but we have found a niche in cyberclasses. We have taught several though the Shining Needle Society and will be doing more. Collaborating with Michael has been a fascinating experience, much like herding cats. Michael: In the past, I worked with Ro Pace and she really helped me bring my design, Frankie, to life. I have edited her instructions and we collaborated on a design that was in Needlepoint Now a few years ago. I have also worked with Orna Willis in the past as an editor and on a couple of joint projects. Carole: I would classify my style as "whatever catches my attention". I have several recent pieces that are inspired by Russian architecture because I find the onion domes, the colors and the textures, and the mix of tradition and heritage, quite fascinating. Michael: My style is the product of seeing, and then experimenting with the logical progression of patterns. They are really structures with symmetry and variations on a structural theme—much like musical composition. The selection of color, and the complexity or simplicity of patterns creates moods—again, just as in music. Michael: My design, Frankie, is an interpretation of a Frank Lloyd Wright-style stained glass window. It is always recognized as such when people see it for the first time. 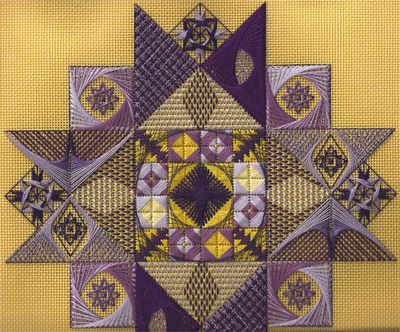 Michael: I have entered my designs in needlework exhibitions in Virginia, as well as ANG Seminar and the Callaway Gardens School of Needle Arts. Carole: My personal designs are available through my website, www.carolelake.com, and my collaborative pieces and classes with Michael can all be seen at www.stitchplay.com. My current designs are intended for online classes, which I do through the Shining Needle Society. Michael: My personal designs are available through my website, www.shenandoahstitcherydesigns.com. Carole and I plan to teach many of our current teaching pieces online and then, where appropriate, sell kits at a later date. Carole: I taught junior high for a number of years, so I've always liked teaching. Michael says I just like to tell people what to do. (He may be right!) My teaching schedule and information about arrangements is all available on my website, www.carolelake.com. Please sign up for my email list (on the front page of the website) for my latest information. Michael: I got into teaching through my local ANG chapter. The more experience I gained, the more I enjoyed it. I am really not the natural extrovert that Carole is! Teaching has been a wonderful way to share the love of the needle and to meet new friends. My schedule and info is on my website, www.shenandoahstitcherydesigns.com. 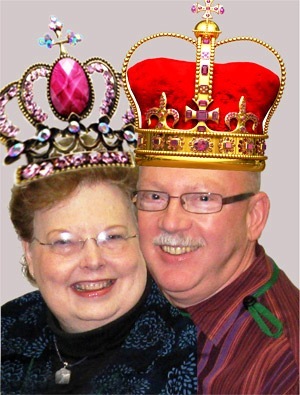 Carole and I are both phasing out of traveling around the country to teach in favor of online classes, mostly through the Shining Needle Society (http://groups.yahoo.com/group/SNS_Home_Room/). I have an email list as well. You can email me at michaeleboren@gmail.com and I'll add you to it. Our collaborative efforts can all be found at our very new website, www.stitchplay.com. My son Shaun is our webmaster, and I don't think it's just the proud dad speaking when I say he did a great job. Carole: I saw Watercolours for the first time at the EGA national seminar in Louisville - about 1986 maybe? A box came into the seminar shop and I happened to be standing around when they opened it - and it was full of Watercolours. I'd never seen an overdyed thread before and I was immediately totally entranced. I bought one of every color, and the rest is history. I loved those early colors - Passion and Meadow and Parfait and Orange Blossom, and, frankly, I haven't seen a skein since that I haven't liked. I was slower to get into the Wildflowers and Waterlilies, partly because I was so in love with Watercolours. But now I can't imagine a design without at least two of the three. Michael: I was introduced to the Caron Collection’s threads at my LNS, The Needlewoman East. My very first piece of counted canvas work used Watercolours and I have been using these threads in my designs and on painted canvases ever since. Lois Caron has a real eye and flair for color and I generally use one or more of the overdyed threads as the starting place for assembling a color and thread palette. I have used Caron Collection threads in all of my designs. I love not only the colors, but also the variety of weights and textures in the collection. Carole: My favorite Caron thread is Watercolours. In fact, my favorite thread period is Watercolours. Very few of my projects don't include it. I just love its colors and it's stability and durability. I frequently design around a particular color of Watercolours. For example, I have a piece called In A Purple Passion based on Passion Watercolours. I love to do projects that start with a skein of Watercolours and work out from there. Michael: I love the Waterlilies. I love the way silk feels and stitches, and I love the soft luminous colors that you find in Waterlilies. There is something very soothing about laying silk that is almost zen-like. I also like its versatility--you can use a single ply for a shadow or multiple plies for a more intense coverage. My favorite color of Waterlilies changes as I find new ones, but right now I'm in love with Ethiopia. Carole: Michael and I have formed a new company specializing in online classes called StitchPlay Designs. I love working with Michael because he's always so excited and ready to try new things. I have been teaching online classes myself for over fifteen years, and it's great to have a partner to banter back and forth with. We bounce our best ideas off each other and usually come up with something amazing that neither of us would have thought of on our own. Michael is a wizard at thread and stitch selection. He makes my best ideas better. And – best of all – he doesn’t let me procrastinate. Well, much. Michael: I'm really enjoying the advent of StitchPlay Designs. It's been fun collaborating with Carole, especially since she does the lion’s share of the paperwork. We complement each other very well. I enjoy playing with threads and coming up with a selection of colorways for our projects. While Carole is handling paperwork, I am busy assembling the kits for our online classes. We will be teaching together in person at Callaway Gardens in January 2012 and 2013. Carole: I plan to teach more online classes. I love teaching in person, but it's not always practical. To me, classes online are the best of all possible worlds. Michael: I really love teaching in person, but it does take a toll on your body. I have learned to love teaching online, especially since Carole helps me with the techy stuff. I'm amazed at how personally involved you can get with online students. While it's wonderful to get together in large groups and meet in person, I find I am enjoying doing this all from home even more than I imagined. Carole and I have adapted our schedules (I'm a morning person and she's most definitely not; she’s up late at night and I’m most definitely not!) so that one of us is almost always available to answer email questions quickly. Carole: I just genuinely like to stitch. I can't imagine a life without needlework. And, I love to teach. So I feel like I've found a job that combines all my favorite things. All my best friends are stitchers, which is fun! Michael: I have and continue to enjoy meeting other stitchers. I cannot imagine life without stitching. I have found that in almost every class, whether online or in person, or whether I am the teacher or a student, there is something to be learned from the other stitchers you are with. Stitchers are generally very sharing. I love to share what I have learned from great teachers like Carole. Carole and Michael: We are both too young to think about our legacy! Has your customer base changed over the years? Carole: I think that due to the advent of the internet, my customer base has become more national and international. In the late 80s and early 90s most of my customers were local or regional. But now, Sally Stitcher from Bora Bora can buy my designs and the threads to stitch them on the internet. Michael: The internet is a wonderful tool that we cannot imagine living without. Through my personal website, my name and my work has reached an international audience that would not otherwise be possible. Carole and I have made our reputation in the classroom and now the internet allows us to share our designs and ideas with a global audience of stitchers. Do you cater to any particular segment of the market – i.e., beginners, skilled stitchers, those interested in traditional crafts or those who want to experiment and stretch their boundaries? Michael: We need to make needlepoint classes both a learning experience and fun. Anyone who has ever taken a class with Carole knows about this in spades. (Don’t ask her to sing! Please!) The internet, in particular, has made the needle arts accessible to a younger audience who do not have the money, time or flexibility to study in local, regional or national teaching venues. 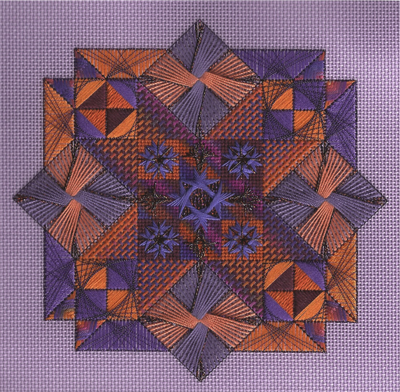 The needle arts have traditionally been passed down from one generation to the next. The internet has expanded the role of the traditional family in this process to the world.